Most people will have heard of iPhone Apps, Blackberry Apps, and Android apps, and App development is now a truly established area, with widgets and add-ons for smartphones, pads and devices, along with web browsers. 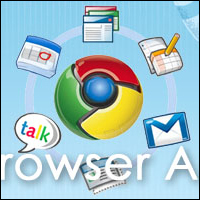 Here I’ll run you through a few nifty gadgets that you can plug in to Firefox or Google Chrome, for super powered browsing and other functions. Nowadays, it’s not just developers who tinker around with code, and if you’re making a website in WordPress, for example, here are a couple of handy browser apps that can really save time and frustration. First of all, Firebug for Firefox lets you point to an area on your webpage, and it then highlights the area of code responsible. Helpful for dealing with unexplained bugs. Next up, the Eye Dropper tool for Google Chrome allows you to select a colour on any website. It then displays the hex code for you. Easy-peasy. Do you find that there’s just a zillion and one things out there on the web that you want to read and blog about? Information overload getting the better of you? Read Later Fast for Google Chrome allows you to save pages to ‘read later – online or offline, and fast.’ This means that you don’t end up with an unmanageable collection of bookmarks or too many tabs open at once. It also allows you to read pages quickly, like a slideshow, and in plain text – no distracting graphics or adverts. And for Firefox users, Read it Later is, guess what, a very similar application for your particular browser. Chrome’s Quick Note is just the thing for lightweight note taking, and jotting down those all important ideas and inspirations. It features cloud syncing, a quick search function, and one-click access. For Firefox aficionado bloggers, ScribeFire is a great little gadget that lets you drag and drop formatted text from web pages, along with taking notes and uploading images. When you’re done collecting all the info, you can use the app to post to multiple blogs. Sketchpad brings the fun of drawing and painting to Google Chrome. Much simpler than Photoshop, but considerably more sophisticated than MS Paint, the app is great for gentle doodling or creating more considered backgrounds and illustrations. The Spirographtool is my favourite. DeviantARTMuro is an app designed for painting, drawing, and photo editing, with a “Submit” button, allowing you to post your creations straight on to DeviantART. With basic and pro versions, the app caters to both newer and more experienced users. Indeed, the site says that it’s ‘advanced enough for expert artists, yet simple enough for novices and everyday doodlers’. I’ll dig out that graphics tablet and have a go. Are you a web app user? What are your favorite three?